New York, March 3, 2004 — SsangYong Motor Company, a leading manufacturer in the SUV and RV segments in Korea, has won an International Stevie Award in The 2004 International Business Awards. The IBAs are the first global, all-encompassing business awards program honoring great performances in the workplace. the world during two months of preliminary judging. Recipients of 67 International Stevie Award trophies were selected from among almost 500 nominations received from companies and individuals in more than 30 countries. Countries with at least one International Stevie winner each include Australia, Belgium, Brazil, Canada, the Czech Republic, Germany, India, South Korea, Norway, Peru, Portugal, Russia, Singapore, South Africa, Spain, Sweden, Thailand, the United Kingdom, and the U.S.A.
Nicknamed the Stevies for the Greek word "crowned," the awards will be presented to winners at an awards dinner on Monday, March 22 in the Sheraton New York Hotel & Towers in New York City. The dinner will benefit the Global Business Coalition Against HIV/AIDS, and will be broadcast live on radio in the U.S.A., and via the Internet worldwide, by the BusinessTalk Radio Network. 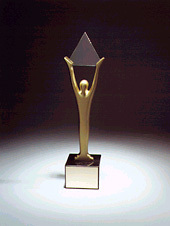 Complete lists of 2004 International Stevie winners and other details are available at Stevie Awards. International Business AwardsSM in 2003, the organization's mission is to raise the profile of exemplary companies and individuals among the press, the business community, and the general public. The New York Post called the Stevies "the business world's own Oscar Awards." Times, Mundo Ejecutivo, Propaganda & Marketing, Selling Power Magazine, and Semana Economica.